Proponents of pixel density should be pleased to hear that this year’s iPad mini refresh, officially dubbed the iPad mini with Retina display, is now available for purchase from the online Apple Store, just in time for the all-important holiday shopping season. Announced alongside the new iPad Air last month, the iPad mini boasts the same 2048 x 1536 resolution and A7 processor as its larger sibling, making the choice between the two easier than ever: do you prefer a bigger screen, or a smaller one? According to research released earlier this year by International Data Corporation, more people are choosing smaller, low-cost tablets to such a degree that tablets sized eight inches or smaller are expected to make up roughly half of tablet shipments this year. However, with pricing starting at $399 for the 16GB, Wi-Fi-only iPad mini variant — and topping out at $829 for the 128GB, LTE-capable unit — it’s clear that the tablet doesn’t fall under the “low cost” category as cleanly as it does the “smaller” category. Considering well-received tablets like the Nexus 7 also offer an excellent experience at around $200, it seems the iPad mini may have its work cut out for it this holiday season. Still, for some, there’s no beating a mobile device running iOS, so it’s hard to imagine the iPad mini not doing at least reasonably well. Besides, it’s the only eight-inch tablet available right now to boast 64-bit architecture. 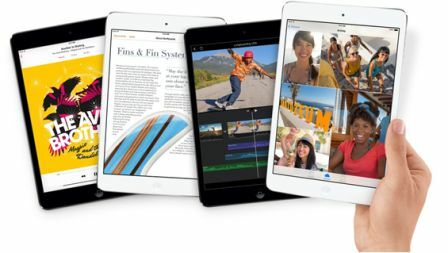 "The response to iPad Air has been incredible, and we're excited for customers to experience the new iPad mini with Retina display," said Philip Schiller, Apple's senior vice president of Worldwide Marketing, in a statement. "We think customers will love both of these thin, light, powerful new iPads, and we're working hard to get as many as we can in the hands of our customers."